The passion and dedication of staff, students and PhD fellows at IHE Delft motivate and unite us all. We strongly believe that capacity development, in partnership, is key to addressing today’s water challenges. Through our work we recognise that a fresh, interdisciplinary approach is needed and that our organization is in a primary position to contribute substantially. In countries around the world, social welfare and economic development depend heavily on water. However, new challenges to sustainable water services and water security exist, driven by burgeoning populations and rapid economic growth which may lead to related risks such as degradation of ecosystems and loss of biodiversity. In addition, climate change is magnifying these challenges by increasing the frequency and severity of events involving too much or too little water. At the same time, it is evident that there are many changes occurring in our society. These are not only found in water-related topics such as clean water shortages, climate change, poverty and conflicts, but also in the changing landscapes of education and funding. Responding to these changes requires flexibility in the organization and operations of IHE Delft and its partners. To maximize societal impact we need to adapt methods of conducting research and transferring knowledge. Our commitment to excellence through partnerships, will provide mutual learning and strengthened capacity development for the water sector, especially in the Global South and, where needed, in the Global North. IHE Delft Institute for Water Education envisions a world free of poverty and injustice, in which people manage their water and environmental resources sustainably and equitably. IHE Delft works in partnership to strengthen capacity in the water sector to achieve global sustainable development. 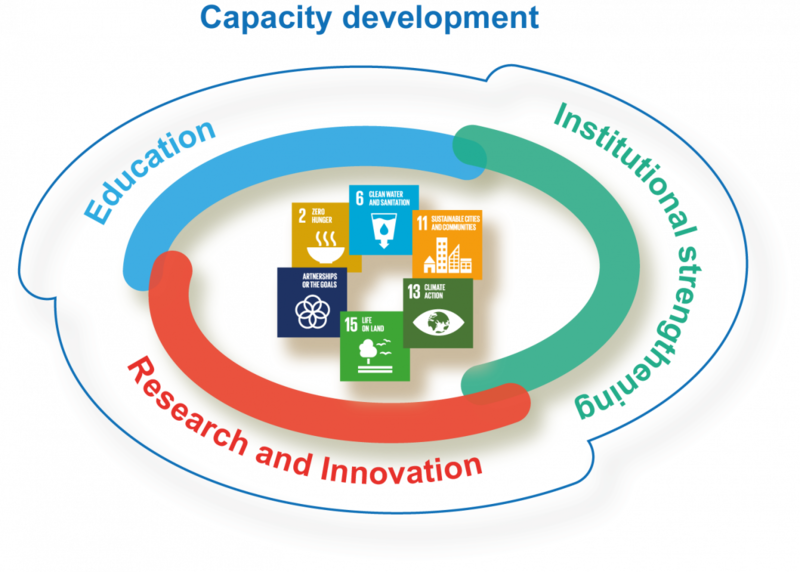 Through our overarching work on capacity development, IHE Delft aims to make a tangible contribution to achieving all Sustainable Development Goals in which water is key. Operating from a water perspective, IHE Delft focuses on regional challenges, such as droughts, floods and deteriorating water quality, and global challenges, such as climate change, ecosystem degradation, land loss, urbanization, sanitation, poverty, hunger, and migration. We embrace clear, integrated approaches and holistic solutions. To increase our impact on the water sector, we will enhance our flexibility by offering tailored, high-quality education and research in Delft and overseas, through strong partnerships within the Netherlands and with our main international partners, especially in the Global South. Flexible modalities increasingly incorporating, online, lifelong learning in collaboration with partner universities. Bring innovations to the next Technology Readiness Level and facilitate nature-based, broadly applicable solutions. Be perceived as an independent broker in the international water sector, through critical reflection, engagement, and an active role in the water community. Reduce IHE Delft’s CO2 footprint. IHE Delft's Strategy 2018-2023: Synergies and partnerships to address water challenges.